Friendship is a wonderful theme to explore in preschool. At the beginning of the school year, it can be difficult for preschool children to step out and make new friends. Through out the school year, children often have to navigate the ins and outs of friendships. Near the end of the school year, children often have to say goodbye to the preschool friends they have made. Books can be a wonderful way to help children explore friendship. 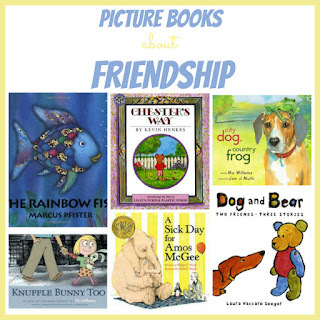 I've been collecting favorite picture books that fit with the preschool theme friendship. You can find all of my book lists by preschool theme. I've compiled lists for back to school ideas, shapes, colors, me and my family, under the sea, animals, gardens, dinosaurs, community helpers, and transportation. Hopefully these book lists will help you in your classroom or homeschool planning. Friendship is a wonderful theme to explore in preschool. At the beginning of the school year, it can be difficult for preschool children to step out and make new friends. Through out the school year, children often have to navigate the ins and outs of friendships. Near the end of the school year, children often have to say goodbye to the preschool friends they have made. Books can be a wonderful way to help children explore friendship. 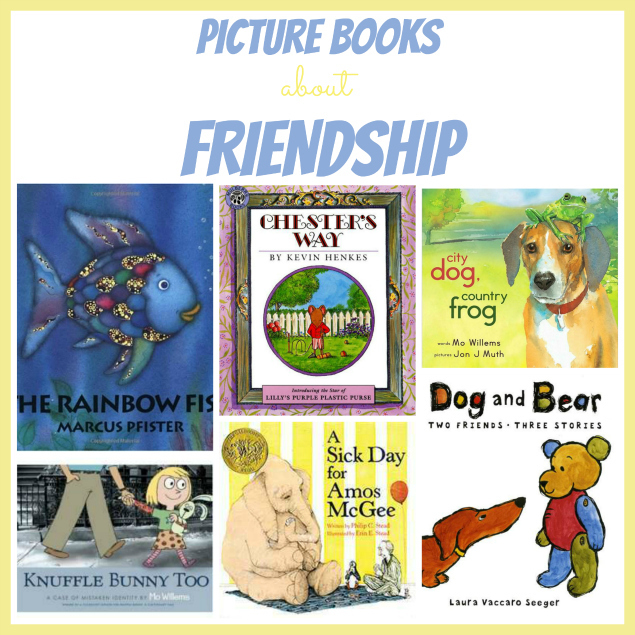 I've been collecting favorite picture books that fit with the preschool theme friendship. Knuffle Bunny Too by Mo Willems fits with many themes that are covered in preschool, but I think it fits well with the friendship theme too. This is the follow up story to Knuffle Bunny, where we meet Trixie, a girl who loves her security bunny. In this story, Trixie has grown up and gone to preschool. In preschool she deals with another student who has the same "nuffle" bunny. The girls have a hard time getting along with each other and eventually the teacher has to step in and solve their dispute by taking the bunnies away from the girls. Traumatically, the bunnies are mixed up and the girls' dads have to arrange a late night meeting to get the bunnies back with their owners. This results in the girls realizing they have more in common than they thought, and becoming friends over their shared interests. Dog and Bear (Neal Porter Books) (Boston Globe-Horn Book Award Winner-Best Picture Book) (Awards)) Dog and Bear by Laura Vaccaro Seeger This book consists of three sweet stories of a dog and a bear. They deal with real friendship topics that kids may face while modeling good ways to deal with friends--such as when one friend wants to play together and the other friend wants to be alone. Chester's Way by Kevin Henkes Chester and Wilson are best friends, they are two peas in a pod. Not only are they always together, they do everything the same way. They are happy being friends... until Lilly moves to town. Lilly does not do things like Chester and Wilson. Chester and Wilson have to learn a lesson about friendship and including others who might seem different. A Weekend with Wendell by Kevin Henkes is also a good choice for a preschool friendship theme. A Sick Day for Amos McGee A Sick Day for Amos McGee by Philip C. Stead Amos McGee is a zoo-keeper. Amos McGee goes beyond simply caring for animals. He plays chess with the elephant and runs races with the tortoise. Amos McGee is a good friend. When Amos gets sick, his animal friends pay him a visit at home to return his kindness. City Dog, Country Frog In this story, City dog visits the country in the spring, summer, fall, and winter. In the Spring, Country Frog teaches City Dog to play frog games. When City Dog returns to the country in the summer, they play Dog games. In the fall, Country Frog is tired and so they spend time just remembering. In winter, City dog arrives in the country but frog is not there. He can't find him anywhere. In Spring again, Country Dog finds a new friend- but he doesn't forget his old friend as he smiles a froggy smile. Good Dog, Carl by Alexandra Day is a book about a loyal dog, but I think it's a beautiful picture of man's best friend. In this nearly wordless picture book, a mother leaves her baby alone with the dog for the day-- I know, I know, that is irresponsible parenting. Let's just say this book is a fantasy more than a realistic fiction book. Don't leave your baby alone with your dog for the day, ok?-- The dog exhibits traits of friendship and loyalty as he carefully tends to the child. It is sweet and it will make you laugh! I love subtle friendship that is displayed in this book. The Rainbow Fish [Board book] Rainbow Fish by Marcus Pfister In this story, rainbow fish has beautiful scales. The other fish admire him, and one little fish even dares to ask for one of Rainbow Fish's scales. Rainbow fish snubs the little fish, and soon the other fish begin ignoring Rainbow Fish out of fear. Well, what good is it to be beautiful if you have no friends? Rainbow Fish goes on a quest to find a wise Octopus who tells him to give away his beautiful scales, no longer will he be the most beautiful, but he will be happy. Hunter's Best Friend at School Hunter's Best Friend at School Have you ever had your child choose the "wrong" friend? Maybe a friend who made bad choices and was a poor influence. Hunter's Best Friend at School is a good book for exploring this common issue. Check out the full review and free printable on Wise Owl Factory's Book a Day Blog. Henry and Mudge Series by Cynthia Rylant is a fun first chapter book that explores the friendship between a little boy, Henry, and his dog, Mudge. The books follow Henry on all sorts of adventures and his loyal companion is always beside him. The Frog and Toad Collection Box Set (I Can Read Book 2) Frog and Toad Series by Arnold Lobel is the classic story of a frog and a toad who are faithful friends. These are great books for the 5-7 year old crowd. They are beginning chapter books with lots of pictures to support the text. The difficulties that Frog and Toad face together will be funny anecdotes that your young readers will be able to relate. Do you have a favorite book that you use to teach children about friendships? I'd love to hear your ideas. Leave a comment here or check it out the discussion of friendship themed picture books on my facebook page. Check out all preschool themes book lists on my preschool themes page. Next week I'll be sharing favorite books for a dinosaur theme. Follow my preschool theme Pinterest board for books and activities for each theme. Great suggestions! I've just started reading and really like your blog!